Public Service Commission UP is looking to fill up the vacancy positions for Assistant Registrar in the various Universities. So those who are looking for the Government job in UP as an officer can apply for this Recruitment process 2018. There are total 21 vacant positions which are going to be filled up through this UPPSC Recruitment process 2018. Special Notice: a). Requests will be acknowledged only when application fee is deposited in the Bank up to prescribed last date for fee deposition which is 27th Nov. 2018. If the application fee is deposited in bank after the last date prescribed for fee deposition, the on-line application of the candidate will not be accepted and the fee deposited in the bank will not be refunded in any condition. It will be responsibility of the candidates to deposit fee in the bank up to the last date prescribed for fee deposition and to 'submit' the application up to the last date prescribed for submission of applications. It is also informed that less or more amount deposited in the form of examination fee shall not be refunded in any condition. Pay Band: Rs.9300 -34,800 + Grade Pay Rs.4800 per Month. Education: a). The candidates must possess the degree of Graduation from any recognized University or Equivalent qualification by the last date for receipt of application form. Good knowledge of Hindi is essential. b). The candidates must possess the working experience of minimum 07 years in any Govt. office or office of University with which the knowledge of Hindi and English drafting and Accounts Rules are essential. Age Bond: Must have age in between 30-45 years as on 01/07/2018. Rs. 105/- for those who belongs to the SC/ST candidates and Rs. 25/- for PWD candidates) to be paid online while remaining all Category candidates have to pay Rs.225 as their application fee. 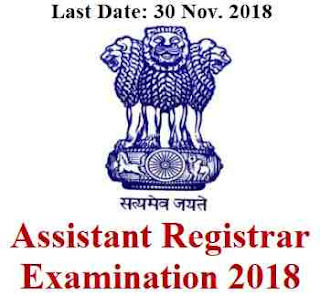 30th Nov. 2018 is the Last Date to apply online.